Pagaminta iš dumblių (Sertifikatas „Tinka veganams“)! Švarus, saugus ir be vandenynų teršalų, tokių kaip dioksinas ir gyvsidabris! 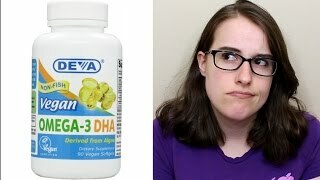 DEVA Vegan Omega-3 DHA is a high quality supplement obtained from algae and packaged in non-animal softgels produced from carrageenan and starch. This is a superb alternative to fish oil and can be confidently used by vegetarians and vegans. Microalgae is grown in a USA facility using drinkable water. DEVA Omega-3 DHA is 100% vegan, vegetarian and is certified by the Vegan Society, the non-profit organization that actually invented the word „vegan“. Clean, safe and free of ocean-borne contaminants. How much Vegan Omega 3 to take? For adults: take one vegan softgel a day with food.